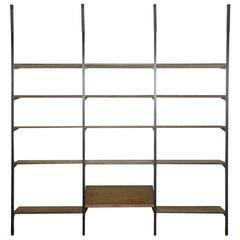 This single bay version of Amuneal’s Collector’s shelving unit features solid machined brass fittings and posts in a warm brass finish. The unit mounts to the floor and to the wall to support a series of easily adjustable solid wood shelves. The wood shelves are fabricated from solid white oak that is milled in-house before receiving a hand-applied oxidized finish that highlights the natural character and beauty of this locally sourced wood. All of our Collector’s Shelving Units are fabricated in Amuneal’s Philadelphia-based furniture studio and can be customized as required for residential and commercial spaces. Hübsches Wandregal aus dänischem Teakholz mit allen Holzpodesten und Regalen. Sehr schöner Originalzustand. Zubehör wie abgebildet, nicht im Lieferumfang enthalten. 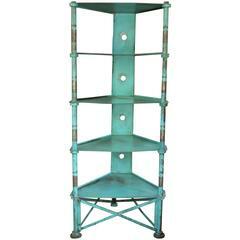 Monumental pair of Industrial shelving units. These are amazing and have multiple uses. Large enough to be considered architectural.